A Kyle Lafferty double helped Northern Ireland to a comfortable friendly win at Windsor Park on Wednesday night. The Burnley striker slotted in from a Steven Davis pass before David Healy's deflected shot made it 2-0. Lafferty headed in his second on 36 minutes but Georgia pulled one back through Healy's own-goal after Maik Taylor pushed a penalty onto a post. Linfield forward Peter Thompson scored his first NI goal with a close-range finish three minutes from time. There was a memorable moment just before kick-off when Uefa president Michel Platini presented Healy with a special award for scoring a record 13 goals during the Euro 2008 qualifiers. 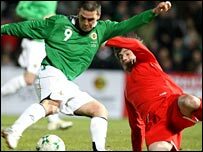 It took 15 minutes before Northern Ireland began to spark and not surprisingly Healy was at the centre of the action. The Fulham striker went close four times before playing a part in the 25th minute opener. Healy pounced on a mistake and pushed the ball forward for Davis, whose perfect pass left Lafferty to provide the side-foot finish from 12 yards. Healy doubled the lead seven minutes later when he drove forward before unleashing which defected off AC Milan defender Kakha Kaladze and past keeper Georgi Makaridze. Nigel Worthington's team struck again on 36 minutes with Lafferty getting in front of his marker to powerfully head in from Healy's pinpoint cross. Worthington made two half-time changes with Crewe's Michael O'Connor coming on for his debut in place of Damien Johnson and Lafferty making way for Warren Feeney. But O'Connor made a nightmare start to his senior international career when he handled a 55th cross to concede a penalty. Taylor pushed Levan Tskitishvili's spot-kick onto a post but Healy slid the ball into his own net as he came in to clear the rebound. Linfield midfielder Michael Gault became the second Northern Ireland debutant as he and clubmate Thompson came on for Healy and Davis on 70 minutes. Georgia fashioned two good chances with Taylor saving from Alexandre Iashvili and Levan Kenia strikes. Alan Mannus replaced Taylor with 10 minutes left to make it a trio of players from Irish League side Linfield on the pitch. Thompson got the final touch from an Aaron Hughes header to take the ball over the line and complete the scoring on 87 minutes. The Linfield man became the first Irish League player since 1984 to score for Northern Ireland - the last was Lee Doherty, who also played for the Belfast club. BBC Sport Player Rater man of the match: Northern Ireland's Kyle Lafferty 8.83 (on 90 minutes). Northern Ireland: Taylor, Baird, Hughes, Craigan, Evans, Gillespie, Johnson, Davis, Elliott, Healy, Lafferty. Georgia: Makaridze, Salukvadze, Kaladze, Kenia, Shashiashvili, Kobiashvili, Tskitishvili, Kankava, Kvakhadze, Kvirkvelia, Iashvili.